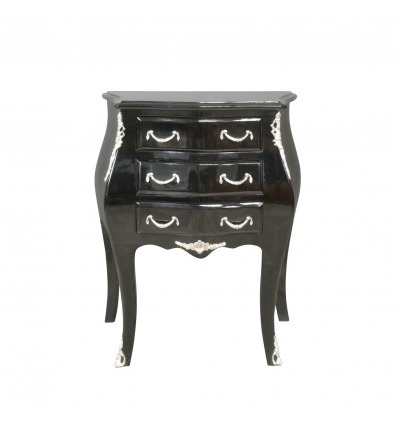 The black baroque Louis XV style chest of drawers has a frame in gloss black lacquered solid beech, opens with three drawers in front with ornaments in silver bronzes. Being a perfect storage furniture for different types of interior pieces, made especially of gloss black lacquered solid beech, this black Baroque Louis XV style chest of drawers is an excellent option to optimize a space. It has three drawers with an assembly of dovetails and its assemblies are crafted in a traditional way with tenons and mortises. Rococo furniture is an excellent option to establish a harmonious and trendy decoration. Inspired by the antique collection, these types of furniture are distinguished by their aesthetics and their dramatic effects. As part of these models, this black Baroque Louis XV style chest of drawers is formed with a solid and precious wood structure, including gloss black lacquered beech, whose assemblages and finishes are made according to the rules of ancient art. This type of wood has been particularly chosen to ensure robustness and aesthetics to the furniture. This barocco chest of drawers adapts perfectly to your needs for additional storage or space optimization. As such, these dressers Louis XV open on the front with three drawers assembled with dovetails. Resuming fashion from the rebirth, these storage compartmentsare fully curved and curved, just like the feet. This style is known for its ostentatious opulence and amazingly luxurious appearance. It is these creations, both inventive and elegant, that pleased the wealthy of the time, and which made royalty and aristocrats the most privileged for these types of barocco furniture. But currently, they are accessible to the general public eager for luxury and elegance to make a better effect in every room of the house. Whether it is the living room or the bedroom, the office or the dining room, the Baroque style chest of drawers is a storage unit that is both useful and design. In a bedroom, it can be used as a bedside cabinet to accommodate phones, lamps, and other, while allowing efficient storage. In a living room, you can drop a vase or a living room phone. In the office, this cheap Baroque chest of drawers will allow you to place documents. 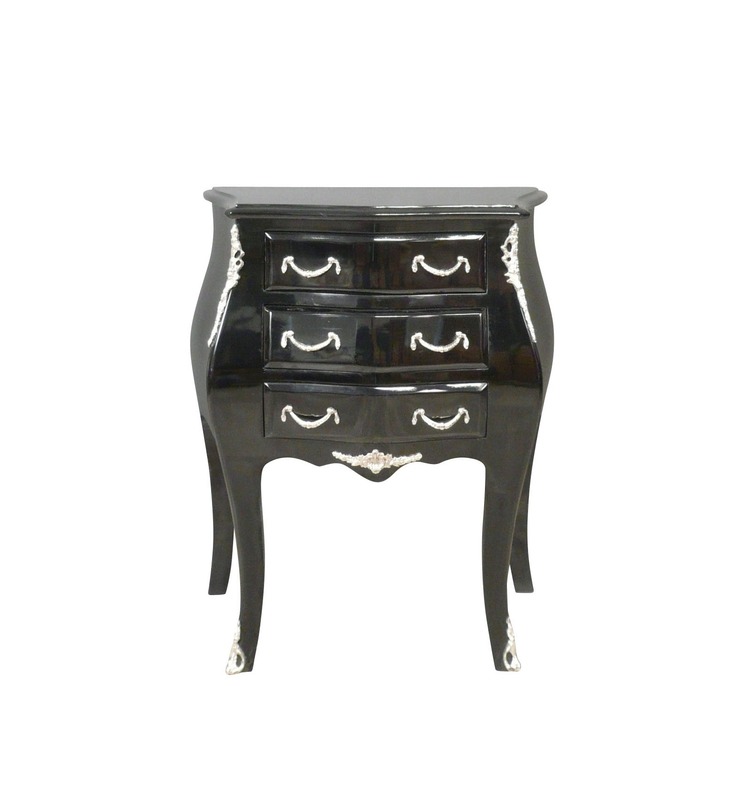 The black Baroque Louis XV style chest of drawers has a solid beech structure, all of whose component elements are assembled with tenons and mortises, as formerly for all antique furniture. The ornaments are in silvered bronze. The precious wood structure has been entirely lacquered in glossy black to provide a perfect finish giving the impression of a true old work of art. Whateverthe place where you put it in place, the combination of precious wood and silver plating can provide this room dresser a retro look very chic and original. If you wish to have more space, this satin black rococo dresser has a lift with three drawers of Louis XV style fully curved and curved. These grant a large storage capacity, which you can use in a room or in any room of your house. Its large flat surface on the top is able to support even a television. These kinds of wooden dressers are essential when you do not have enough cupboard for storage. In addition, they can adapt to different current trends. Give your interior more antique look by matching this dresser with other furniture of this style.